World-class Bandon Dunes Golf Resort, comprised of Bandon Dunes, Pacific Dunes, and Bandon Trails golf courses, is a 10 minute drive north of Bandon. 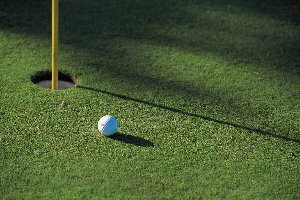 The newly opened 72 par Bandon Crossings golf course is just 5 miles south of town. Old Town Bandon offers quaint shops, a modern public crabbing pier and boat launch, and a variety of dining options. Bandon Marsh National Wildlife Refuge provides easy access and study of the estuary ecosystem, whether on foot or sea kayak trip up the Coquille River. 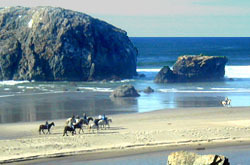 Try horseback riding, or some of the best windsurfing on the Oregon coast just out the front door. Hike or mountain bike on some of the many forest and beach trails nearby. Take the kids for a visit to the West Coast Game Park with its walk-thru safari, just 7 miles south of Bandon on Hwy 101. Outdoorsy folks will find offshore, salmon and steelhead fishing easily accessible nearby . Jump in your car for the short drive to the Shore Acres State Park gardens, the South Slough Estuarine Research Reserve or Charleston fishing harbor. 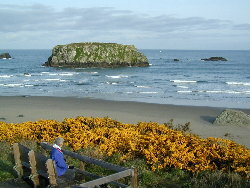 The Bandon area has a wide array of attractions to complement your beach stay, whether for a weekend, week or longer. Seaview Townhouse is located adjacent to the Viewing Area for the Offshore Islands National Wildlife Refuge. 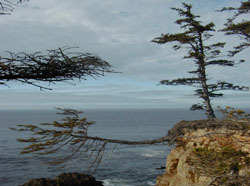 We are located on an 85-foot headland above the shoreline. The well-maintained trail to the beach is just steps from the front door, and guests can have their feet in the sand and the surf in less time than it takes to put on your shoes and coat.